I'm planning to build an off grid solar system to be implemented on our new house; Electricity & fuel is pretty very expensive here in our country so I decided to have an off-grid. If there's something wrong or inefficient with the setup please feel free to post. Once the battery bank is fully charged will the CC give all the loads to the inverter instead of charging the batteries? In my estimation for our consumption per day is 4,000-5,000 watts since air conditioning will be in a daily usage but from time to time the use of electric stove, washing machines, iron cloth. Just to be safe, lets say I'll be consuming 12,000 watts per (24hrs) day, How much battery Ah do I need? In our country the sun rises brightly at 8:00AM and goes down at 5:00PM. Finally, Can I buy/place order/pick em' all once we visit your store? Okay let's check the terminology and go from there. First, maximum load in Watts. Second, daily consumption in Watt hours. Everybody gets this confused. So do your maximum loads really add up to 12 kW so that you'd need two XW6048 inverters? That is not the same as the daily Watt hours consumed. If you are planning on 12kW hours per day (which is not unreasonable for a full size house) then that is 250 Amp hours on a 48 Volt system. To make it a good system you want that to be 25% of your total capacity, so the battery bank would be 1000 Amp hours. That is quite sizable. This is the point where you stop and look at conservation again. Definitely look at eliminating that electric stove if at all possible. If you're going ahead with that size, you will need two charge controllers (it's okay to connect them in parallel) because you will be trying for a peak charge current around 100 Amps. They would be fed by two separate arrays of approximately 3200 Watts each. Your plan for thirty-two 240 Watt panels would be more than enough. This will cost a lot of money, and again you go back and examine the conservation angle again. A good plan for batteries in hot climates is to dig down and put them underground: they like to be kept at a constant temp and do not like heat. Some people do the same thing in the cold climates (like where I am) but for exactly the opposite reason! you can parallel another controller, but the pvs should not see more than one controller. that is, this group of pvs at A serves the first controller and this group of pvs at B serves the 2nd controller. if you mean will the power be available for the loads once the batteries get what they want, this is a great big yes as all the batteries would want at that point is a float charge. if your loads exceed the capacity of that coming from the pvs then the batteries will chip in with a bit of their capacity. theoretically, it should be at least double what your daily watt hour loads are so at a minimum this would be 24,000wh. sometimes the batteries need to handle ripple currents induced by the inverter and that should be at least 100ah per 1,000w load. note-to find the amp hour capacity of the batteries from the watt hours simply divide the wh by the battery bank voltage. now i don't think you'll have too much problem with reserve on that battery bank. for the record 24 2v cells at 2550ah is 48v at 2550ah for a total wh of 122,400wh. i would not parallel another string of batteries to make this 5100ah as you might then lack the pvs to charge something that big. keeping the batteries charged will certainly be some appreciable power. the loads are large too so a battery monitor may be a good idea to get a rough idea on the state of charge (soc). i don't think it's critical to keep the batteries at 25 degrees c, but cooler does help some. don't forget about the weight of these batteries. bottom floor is a very good idea. use the a/c sparingly for yourselves as i don't think it's a good idea to waste it on cooling the batteries. you will have to call the store to make arrangements as business is not conducted on the forum. i hope i got to all of your concerns and didn't overlook anything. Regarding your system--First understand your power needs (ideally, by usage/appliance in Peak Watts, kWatts*Hours per day, seasonal needs, etc.). Next look at conservation--Almost always cheaper to buy new appliances/change your habits than to build a "bigger" Solar PV system (cheaper to conserve a Watt vs generate a Watt). After those two steps, then we can talk about hardware (don't buy anything just yet). Remember that Watts and kWatts (1kW=1,000 Watts) are rates, likes Miles per Gallons or Liters per Hour. When you take the Watts and mutilply it by time (Hours), then you have an amount (like miles driven, liters pumped, kWatt*Hours consumed per day). Knowing your peak loads drives the inverter size (kWatts of rated power) and to a degree, the Amp*Hour rating of the battery bank. Also, total amount of power used per day (kWatt*Hours) will size the battery bank and solar array (and the average amount of sun per day for your area by season). When we talk about "hours of sun per day"--Basically, that is noon-time equivalent "full sun" (about 1,000 Watts per m2). In much of the US, most people get around a minimum of 4-4.5 hours of sun for about 9 months of the year. Some get ~5 hours of sun in summer, and a few places get over 6 hours of sun in summer. Of couse, if you use A/C, your summer electrical needs may be higher than your winter needs (as an example). In some areas, during rainy/monsoon season, you almost always have to use a generator for backup power... There are a few days a year where I get ~1-2kW per day, yet during summer I get close to 20 kWH per day average (near San Francisco CA, USA). Also, look at the cost of power from your utility... In many areas, the price of Solar power (battery replacement every 6-10 years, new inverter/charge controller/electronics every 10+ years on average, etc.) make off grid solar power fairly expensive (typically in US, about 5-10x more expensive than utility power, on average). Have you looked at Kill-a-Watt type meters for measuring appliance loads (there are 230 VAC versions available too). And there are whole home systems too (like this T.E.D. and others). There are other meters/techniques to estimate power usage and if you are currently on utility power, you can even use your meter to estimate your daily usage. It looks like some areas in the Philippines may have significant marine layer/monsoon that may reduce the amount of solar energy to around 4-6 hours of sun per day (depending on season). I did not read the report closely, but the more accurate information you have for sun in your area, the better you will be able to size your solar array. After reading BB's post now I'm having doubts if I we're to build a solar system or not. 1st is about the Utility grid. Even though Philippines have been known to depend in RE sources like Hydroelectric and Geothermal Power Plants that they say 'cheap' but I still pay around $180-$200 a month. I'm still based here in our old house and the appliances are few. I believe we're already doing our best on conserving/saving energy as we are actually forced to do so because of the non-stop increase of electricity bills every year or so. We actually already condemned plenty of our appliances (microwave ovens, water pump, etc.) for that reason, we've given away our 2hp a/c and replaced it with 465 watt a/c; replaced all of our fluorescent lamps with power saving bulbs. I looked into my electricity bill and we're consuming 500kWh per month?!. As for my estimation if I sum up all of appliances and lighting we have 2kW-2.5kW of electronic devices. What really hurts as well in my utility bill is the 27% distribution fee. I really want to be free from the utility grid and be power independent cause I feel like if I were to sum up all those electricity bills we'll be able to afford a large off-grid solar system. 2nd is I thought that "inverter/charge controller/electronics" have a lifetime of service (25+yrs average life expectancy) and I'll only be obliged to replace the batteries at its end life BUT its not. We'll that's going to hurt my investment. The plan is to invest; build a really good, huge off-grid system and be free at last from the utility grid and live a A/C'd life all day everyday not having to conserve/save energy as much as we do when we're still in dependent in grid. But I'm also considering grid-tied as for the reason for choosing a grid-interactive xantrex inverter. I have to re-think of building one now. 500 kW hours per month is not unusual. It's about the same as our in-town house, and that has electric hot water (which is going to go as soon as I get around to it). It is still a significant amount of power to provide from solar, and that power comes at a fairly hefty cost. Most of the equipment should last 20 years. 25 years would be pushing it. Inverter may fail sooner, especially if run at its maximum. Batteries ... ten years at the outside with good care. If the utility will buy surplus power from you then GT or GT-hybrid would be a better choice than off-grid. You'd always have someplace for the power to go, which is a major problem with off-grid; once the batteries are full the panels can still produce power but without loads to make use of it that power potential is lost. Definitely spec out all the options before making the investment! You may get better than 10+ years life from your electronics... But I would still recommend plan on having the money set aside, if it is needed. Many times, the failures are repairable, but the components and factory/field support for 10+ year old equipment is almost non-existent. The electronics industry is changing so fast that older components (in as little as 2 years from introduction) are no longer available. I used to work at a company that made voice mail systems which are designed for 10+ year life--We spent much of our time trying to find components that would be available a decade later for production and repair during the initial design process (and purchasing had contracts for last buy/distributor stocking of older products to enable us to continue production and repair). 500 kWH per month is not bad--especially if you are using electric appliances for cooking/hot water/etc. As an point of aim, a good starting point is to get down to ~100 kWH per month (around 3.3 kWH per day) of power usage... That is a fairly small Off Grid solar PV power system and of reasonable size/cost for most people. In my mythical comparison, the "high power" microwave uses almost 1/10th the power of a typical laptop/networked desktop computer system left on 24x7. Many times, our high power costs/usage is cause by the "smaller" items (computers, TV, DVR/Sat Receivers, entertainment systems, etc.) that are left on 24x7 vs the "big stuff" like microwave and well pumps. Buy a generator for independence. Most all tropical areas are always subject to alot of lightning. The whole system can be lost at anytime. This is one of the main reasons not to do what you have in mind. What Dave says... In areas with significant weather hazards (lightning, wind storms, hail, etc. ), chances of damage to PV systems and their components are significant. Our host, NAWS, has said in the past that with lightning strikes, the AC inverter's output stage was what failed most often. And if you have significant stretches of poor weather (weeks of Monsoons, etc. ), a solar PV array may output an average of 5-10% of its daily sunny day capacity (during very dark/cloudy days). So a backup of generator power (or even utility power) is usually still needed unless you can go days without needing electricity. Perhaps you can find other projects to help reduce your power usage/costs. I can't really say our place here is often hit with hurricanes and thunderstorms but I'll admit that its a huge problem for everyone when 1 comes, it's all cloudy and raining all day for a week or two with no sun at all (For 3-4 months). But when summer its an all day bright sun and clear skies (5-6 months); we're suffering in agony from heat cause we can't use a/c all day and only at night at a limited time. For having a 500kWh a month? I'll give you all of our electronic appliances that is often used in daily basis. 2 Computer's 1 running 24/7 and another 1 from time to time. 1 10 Cubic ft ref. -We don't have any electric stove cause we are gas dependent in cooking kitchen stuff. For what Dave said, I might actually consider of having one; more simple w/o CC and electronic stuffs, maintaining it would be similar to an SUV. Can you recommend or suggest a extremely fuel efficient diesel generator? Still diesel is expensive as well. actually there is more conserving that you can do. *right now a pc is a bit of a power hog, but in the future i recommend going with a laptop as they use very little power comparatively. unplug such things as printers and speaker systems when not in use and that can be made convenient with a power strip. *btw, power strips are good to use on the phantom loads of many appliances such as your tv. most lcd tvs do have power save abilities built right into them as well. this is usually the backlight that can be turned down in intensity to not only save on power, but you'll save on the life of the bulb too. *often times all of those fans running can be replaced with another a/c unit and you'd actually save on some power. you'd still want to have some air moving and either keep a few of the good fans or opt to get some small muffin fans if they are available there. most muffin fans are dc operated, but there have been some that are ac too. *odds are that 10 cu ft refrig draws as much as a large new refrig. if you can get a meter to measure appliance power draw like a killawatt meter, but geared for your country's ac voltage setup, that would be great. i think you guys use 220vac if i remember rightly. if you use 120vac then the killawatt itself should work. a search by you or somebody else chiming in on that would be in order. btw, when you say you have power saver bulbs, are they incandescent, cfls, florescent, or led types? It's CFL niel, about unplugging the appliances when not in use? Yeah, we have Multiple Outletstrip w/ Breaker in every appliances we have like LCD, Bluray and speakers system as well as my computer, so we'll just have to switch off the ones that's turned off. Our LCD have this power energy saving set on max in Natural picture settings (I saw it in the manual that it can prolong the lcd life at the same time saving power). We use 220-240Vac 60hz in our power outlet. About the fans, we only use about 2-3 fans from where we are gathered so replacing it with an a/c will be a huge blow on my billing every month. I never heard of kill-a-watt? But I'll try to find one here, is there any alternative for that, I mean something that is widely available worldwide? But of course it'll definitely work if its freezing cold outside like in your place. Again I've thought about another setup of off-grid hybrid system that will be fairly expensive. Why is the 225 watts pv more cheaper than the 220 watts? Isn't it why there's a PV, Inverter, Electronic stuff grounding for surge and lightning protection? Will the inverter share the load to the utility grid when I exceed the inverter load limit instead of the genset? I've already spec it all out, By the time my inverter/CC/electronics dies there will be a new generation of inverters/CC's solar system that will probably 10x more better and those expensive panels have a pretty long life span and I can still be able to use it for future generation solar systems. My investment is safe for those panels. If it hasn't been said, it should be. You do realize of course that if you have the grid available, then going with a battery based system is going to yield power that is very much more expensive per KWH than grid power? You do also realize as well that battery based system will cost about twice as much per watt of capacity, and will deliver about half the power, leading to efficiency of about 1/4? The long and short is, if you are looking to cover your needs for emergencies, then a genny is the way to go. The Op mentioned that his weather related outages come with long bouts of rain and grey weather,, not a good recipe for emergency power. Because that's the way it is sometimes. Whatever they make and sell the most of ends up being cheapest. Not sure I understand this one, but there are definitely ways of protecting equipment against surge and lightning. Yes. The inverter doesn't care where it gets the 120 VAC from; if it senses the presence it switches to charge. It is even possible to rig this up to switch in the utility power automatically, but it takes a bit of extra effort (controlling a relay for the AC IN via auto gen start circuitry). Depends on the inverter. The XW will do this load sharing. That depends on the meter and how the utility handles buy-back. Some require a separate meter, some (most) a bidirectional meter. If you connect without the company's knowledge chances are good you'll have the wrong meter and will end up paying for the "extra" electric you produce. The plan is to invest; build a really good, huge off-grid system and be free at last from the utility grid and live a A/C'd life all day everyday not having to conserve/save energy as much as we do when we're still dependent on the grid..
How does one respond to such thoughts, knowing that off grid power is far more expensive than grid power, and that when it comes to conservation, we only begin to learn about conservation after we've gone off grid and have run out of power. On top of that, we have to learn to use only what Nature provides, WHEN Nature decides to provide it, otherwise we do without. To be successful at living off grid demands a whole different mindset. Gone will be the days when, without any thought, we fire up whatever we want and use it without limit whenever we want, for as long as we want. It can be a very rude and shocking awakening for anyone not already in the required mindset. It's a whole new way of life, very, very different than what we were brought up to believe is, and accept as, "normal". I'd say that's a good response, Wayne. Let's see, do I pay the utility ten cents per kW hour and make them responsible for delivery, or do I generate my own power for seventy-five cents per kilowatt hour and have to look after all the maintenance and repairs myself? We have two houses: one in town where BC Hydro supplies the power and one cabin in the woods where I do. The only reason the cabin has solar is because it is so remote that the only other option is to run a generator and that gets very expensive quite quickly when you spend six months a year living there. Anyone who thinks going off grid will save them money on electricity hasn't done the math. Eliminating the electric bill is not the same thing as saving money. Almost anyone Coot, over time some of my clients and mysellf are saving money. 20 years offgrid and doing what Wayne wrote about, "always thinking about the resource that is available". Protecting the investment, and a litlle bit of luck when the big guy is unhappy. Depends on the circumstances. Try it at 52 Lat in Canada. Initial up-front costs are higher than in the States, no rebates or incentives here for GT or anything else. They don't even take the PST off anymore. Add to that the cheap BC Hydro and you have a very anti-solar climate. Some places in the world have grid power so unreliable that it might just as well not be there. In other places even grid-tie doesn't make any economic sense. The OP is just guessing that his utility bills would be offset by off-grid solar. More often than not this isn't the case. Today it is raining. The generator is running. Solar isn't working at all. Utility power would be there if it weren't several miles, a few million dollars, and endless legal hassles away. Then what's the point of having a solar system then? Ok, I already understand the off-grid (remote areas unreachable by the utility grid which is so damn expensive at the same time a big waste of money) and grid-tie systems (That can actually save money right? the reason for its sudden boom of popularity but still needs a good loc for it work, damn!). I think I've been fundamentally mislead by people who advertised this solar stuff to save money and energy, a good investment, free energy from the sun etc... You should've post a sticky in the forums that Off-Grid is just a big waste of money and it'll turn all your investments into nothing and absolutely for remote areas only. I might just stop saving or conserving energy and just buy a split a/c or a centralized a/c for the whole house and pay $1000-$2000 a month (24K a year is not as bad than a 50K worth of off grid solar that is practically just a big waste of money right? It's that expensive and you still need to do all that conserving & saving energy). I don't know if its normal but can I ask HOW MUCH is your billing looks like? I'll give an example of my bill so I want to know what its like with you guys living in the west. Well its always like that despite all the effort of conserving energy. I really thank the ppl here for those honest posts and answers. Final decision? No more solar systems and I'll just stick with my utility grid. I've been experimenting with my old cars alternator and looking to make it a self propelled alternator dunno' it could or might defy the laws of thermodynamics and work. Well that is something that will definitely save a lot of bucks. What Wayne and I are both trying to say is that to many people automatically fall for the "free power from solar" hype out there and don't consider the actual numbers for their particular situation carefully enough. You definitely need to cost it out first; never assume it's going to be cheaper because most of the time it isn't. However, some utilities soak you hard for power (especially by tacking on all the extra "fees") so your real per kW hour rate is much higher than the one listed. Ironically, this is particularly true of small power users who have to pay the up-front flat fees just to have the service that provides their measly amount of consumption. Conservation, which everyone tells us to do, is penalized in this manner. Hurrah. If someone wants to "go green" and of-grid despite the costs then that is their political decision and there's nothing wrong with that either. Lots of people spend their money making political statements: this is just another way of doing it. The grid-tie solar power usually works out to the best bet, though. The way things are these days, even without the rebates and tax incentives it makes economic sense in some areas. Sometimes, though, you can be right next door and on a different power company that isn't so appreciative of clean generation. There are a few horror stories on the forum about companies demanding so much red tape and rigamarole that it just isn't worth the effort to try. So if you are looking at it from a purely economic stand, do the math first. Expect 20 years from most of the equipment and know that the batteries won't last that long and that sometimes things go wrong and need fixing/replacing. Moderator Bill had to have his panels replaced (under warranty). I've had to get brand new batteries exchanged in one month because a plate collapsed. It can work. But do the math first and know what you're getting in to before you start spending money. Looks like you've got a $238 per month utility bill, much of which is those impossible-to-eliminate fees. In ten years' time that would be nearly $30,000. You could just about get an off-grid system capable of (conservatively) 10kW hours per day for that (depends on how much sun you get, for one thing) lasting 10 years at least. See how much system you can afford, put the size into their program, and then take a look at its production and how that would fit with your needs. It's not 100% accurate (nothing is) but it is close enough probably to tell you if solar is worth the investment for you. Since the U.S. has decided to add tariffs on to Chinese panels and thus curtail supply while raising prices everywhere arguably solar is going to become less economical. It's a pity, because it was really starting to become practical in so many areas. On the other hand, how much will your utility rates go up in the next ten years? P.S. : You're quite right about the "self-propelled alternator". That's perpetual motion nonsense. Off Grid Solar electric does have it's place. Unfortunately, if grid is available, that place is not to save money. Does it save me money? No. But if I live another 20 years, I might break even. Maybe. In the meantime, as long as I'm able to look after it, it gives me pleasure, peace and independence. Some things in life money can buy. Many things it cannot! This thread is a classic example of avoid "ready, fire, aim" and doing ones homework before spending a nickel on any hardware. This forum is a great resource for unbiased Information for newbies to use to make rational decsions before they spend money. Folks need to understnd the ramifications of various choices. The long and short of it is, that you will most likely never "save" money with a battery based system, when you factor in the cost of battery replacement. Pay back from a grid tie system is a variable, depending on many factors including rebates, tax credits, feed in tariffs etc. in some cases pay bck can be a short as a couple of years,, or as long as 20. If you assume that the price of electricity is likely to go up over time, then pay off becomes faster. (the gist of battery based systems is tht battery costs are likely to go up as well) with a grid tie system, your costs are know and mostly fixed. One has to calc in the replacement cost of inverters etc, but the basic hardware and installation should easily last 20+ years. the killawatt meter is made for 110vac and not 220vac. you may need to do a search for power monitors to get something that will work with your power. this is the best way to determine what you may really be drawing. if you can't find anything then ask your power company if they know of monitors that will work that are reasonable in price. you don't need professional equipment costing big $ just to get a rough idea of your appliance's power draws. as to saving money it depends on circumstances dictating the type of system used and the amount of time for payback. it can save you, but it will be a long time for the benefits as it is like prepaying for your power that you will generate and you bank on the equipment for solar lasting long enough to reap a payback and this payback point can come sooner if utilities raise their rates as they often do. most use a gt system for fastest payback, but there's also gt with battery backup if you feel you have too many outages or they last too long. often a generator can suffice for small periods of time without the need to have batteries. lots of ins and outs about what's right in every circumstance though, but battery systems are needed in cases where fast switching is paramount to avoid any disconnect of power. a simple example is a pc as it will go bonkers if the power is interrupted for a few seconds and a generator would not kick on in time to stop this. solar has been hyped by some commercial entrepreneurs out to rip people off and this is including some people in government painting pictures of things that get out of perspective. most in the public don't know or are anywhere familiar enough with the wide applications and technical aspects presented by a renewable resource like solar. the latter is one aspect this forum has been able to solve to some degree. we do encourage all who come here to read as the knowledge benefits them. granted not all of what is said will be needed by everyone, but isn't it good to know where you might find out should you need to know? we can't promise to know all of the answers, but sooner or later somebody out there does come up with it. some things like, being able to throw a few pvs up and disconnect from the grid and do it cheaply, we wish was an answer. it may still be a partial answer for you, but i can't determine the degree it may apply or in what respect as that is sometimes an individual preference. Our ranch in conservation borders a majestic desert mountain national forest and wilderness landscape. The off grid system we built helps protect this public view shed as well as assure our back country ranching values and lifestyle. The cost of bringing in the grid would significantly exceed our off grid investment. And, the local area grid experiences frequent power spikes and outages. More grid intensifies development and land speculation which adversely impacts wildlife corridors, livestock management and reduces hunting opportunities in my country. I believe future rural cooperative utility rates will significantly increase. Solar hardware costs will offer increasing reliability, performance and longer service replacement intervals. Our one time initial off grid civil infrastructure (excluding solar components) sunk costs were constructed to accomodate upgrades over time without going back and having to do more civil work. We didn't build our off grid system to make a green political statement nor to save money. We did it to perpetuate our ranching heritage and preserve something for our childrens children. There are many reasons to do things which are not necessarily driven by money. As niel says personal preferences play a part in off grid decision making. For many people cost is the standard and the grid is surely "cheaper". The cost of bringing in the grid would significantly exceed our off grid investment. And, the local area grid experiences frequent power spikes and outages. More grid encourages more developers and land speculators. All that is fine,, if you don't have the grid readily available, but I believe the OP has the grid available, which is another conversation entirely. Some of us already do look back and laugh. 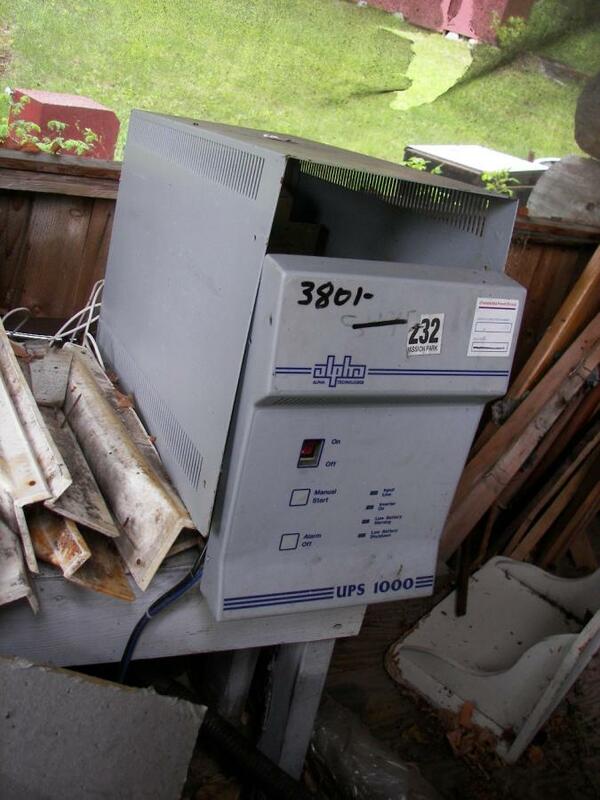 This was my first "inverter": 36 Volt Alpha UPS unit got for free. It's still here (minus a few parts) because it's too heavy to dispose of.